So the other day, The Cohort** and I were hanging out at my home-away-from-home, K&S International Market, when we found some sweet-looking red bell peppers. 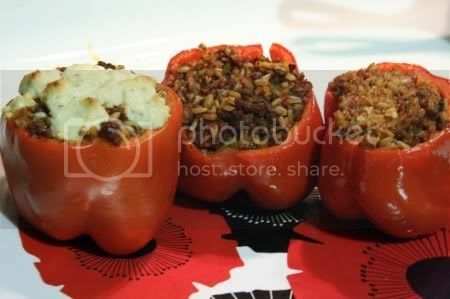 I needed to get a couple anyway since I was planning on making some rad Moroccan Sunset Salad, but then she casually mentioned how it'd be cool to make some stuffed peppers with them. Maybe have a 'Throwdown,' or something. Right then and there it's like something inside of me just snapped. I got this wild Charles Manson look in my eyes, stretched my arms out wide and said, 'Girl, you don't know who you be messin' with! Oh, I'll throw down with you, alright! I. WILL. DESTROY YOU!!' Then I heard somebody say something about 'Call 911,' so we quickly left and got our peppers elsewhere. Anyway, the important thing is that we did get them, because these two recipes are pretty damn good, even if I do say so myself. Not that I need to, since Amy will vouch for mine, and I'll vouch for hers. I think she knew I was impressed when, after a couple bites, I got out my camera and started taking pictures. Yeah, I was impressed. More than that, I was nervous. After only a couple bites, I was pretty sure I was going to lose this one. However, I managed to bring it to a draw. Yes, we were the only judges, but we're both pretty fair and honestly concluded that they were both equally good. *I originally used 1 T each of whole sage and rosemary, but ground them myself, resulting in approx. 1 1/2 t each. Let's start with the oat groats. I discovered them about a year and a half ago or so. Long story short, I made some rice and beans with them, mistakenly thinking they were brown rice. Turned out to be the best rice and beans I'd ever had. Oat groats are like a combination of brown rice and pearl barley- nuttier and chewier than regular rice. They cook up the same, though, so whatever recipe you follow for regular white rice should work the same for the oat groats. I made mine in a rice cooker, and because I figured the groats would absorb some liquid from the tomatoes and whatnot, I cut back slightly on the water, using 375 ml instead of 400. I used Bob's Red Mill brand for this, which should be available pretty much anywhere, but any grocery store with a halfway decent bulk foods section should have some too. Otherwise, there's always Amazon. While that's going, cook the sausage about halfway, add garlic and shallots and cook until browned. Deglaze with a splash of balsamic vinegar (you may need to drain the fat off first; I was planning on it, but found it unnecessary). Then add in the tomatoes and all the spices. Let simmer on low heat while you blanch the bell peppers. As far as the blanching goes, I brought some water to a boil, turned it off, and then dropped in the peppers for one minute, after which I dropped them in some cold water. After they came out of the oven, they definitely still had some crunch to them. Not that I consider that underdone, but I guess underdone would be better than overdone. However, if that's not your thing, I'd probably go an extra 30 seconds to 1 minute on the blanching, or keep the water boiling instead of turning it off. 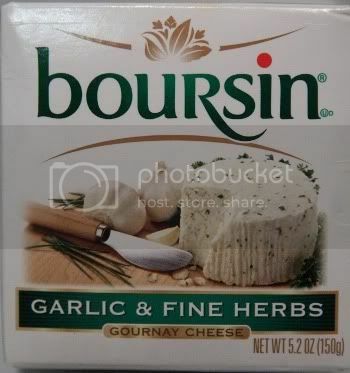 Now let's talk Boursin cheese. From left to right- cheese on top, straight up, cheese mixed in. For some reason, I mixed up the order for this photo- L-R - cheese mixed in, cheese on top, and straight up. 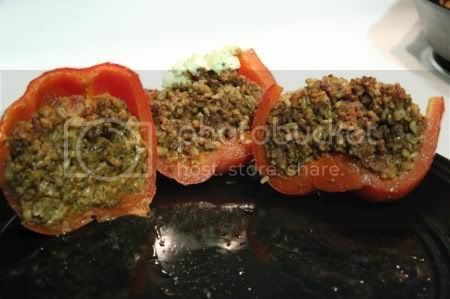 I also forgot to note how long I put them in the oven for, but it wasn't long- maybe 15 minutes at 350 F. All the filling is cooked already at this point so you're basically just bringing the whole thing up to a hot eating temp, as well as maybe finishing off the peppers. I really liked all three, but my favorite was definitely with the cheese mixed in. The Cohort also liked all three, but said the one with the cheese mixed in tasted like it should be wrapped up in a tortilla and eaten like a burrito. I can see her point. Maybe I'll even do that sometime. So this is my version. The Cohort's is up next. Ours are a bit similar (I find it interesting that we both, unbeknownst to the other, used sumac as a secret ingredient) but different enough that it's worth making both versions. ** The Cohort, aka Amy Housewine, aka Amy Crowe, is my friend and roommate. She'll be posting here occasionally, as well as helping me come up with new stuff to make. If you want to get a feel for her writing style, her page is here- The Unicorner of Vengeful Atrocities. (I know, right? She's weird. And she has a thing for unicorns. Plus she's just weird. But she's pretty cool too.) The writing over there is definitely R-rated. She likes to write, and speaks her mind when she does. But that's her blog, and this is mine. Obviously very different, not just in content and style, but in language- i.e. mine's more PG. Yes, it's going to stay that way.